When two different metals come in contact with each other in presence of an electrolyte (e.g. water), they form a galvanic cell in which the lesser noble metal (e.g. Zn) corrodes in favour of the more noble metal (e.g. steel). This electrochemical reaction is the base for the complex field that is cathodic protection. 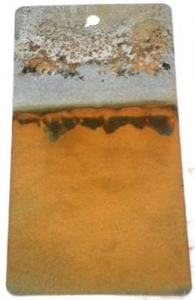 Galvanic, cathodic protection, or active protection, arises from zinc (the anode) sacrificing itself in favour of the base metal -steel (the cathode) with the resulting flow of electrons preventing steel corrosion. In this way the protection of the metal is guaranteed, even when the zinc layer is slightly damaged. Other well-established methods of cathodic protection include hot-dip galvanising (HDG) and zinc thermal spraying, both of which exhibit a constant sacrificial rate of the zinc layer. With ZINGA the sacrificial rate reduces dramatically after the zinc layer has oxidised and the natural porosity has been filled with zinc salts. Additionally the zinc particles within the ZINGA layer are protected by the organic binder without adversely affecting the electrical conductivity. This enables ZINGA to create nearly the same galvanic potential between the zinc and the steel as hot dip galvanising but with a lower rate of zinc loss because, put simply, the binder acts as a “corrosion inhibitor” to the zinc. If the ZINGA layer is sufficiently damaged to expose the base metal below, the steel would form a layer of surface rust but no corrosion would take place beneath it. In other words, if the surface discolouration was removed, the steel below would not be pitted or eroded. This is called “throw” or “throwing power” and enables ZINGA to protect bare metal up to 3 – 5 mm away from where the coating ends – slightly less than new HDG. Zinc sacrificial anodes used on the steel hulls of boats below the waterline work on the same principle to protect metal in the surrounding area. ZINGA is simply a different form of these anodes and is therefore sometimes referred to as a liquid anode or sheet anode when used in immersed conditions. The ability of zinc to provide galvanic protection is a function of its mass per given area. Dry ZINGA contains a minimum of 96% medicinal quality zinc by weight, the particles of which are significantly smaller and purer than those found in normal “zinc rich” coatings. The ZINGA particles’ small size and elliptical profile ensure maximum contact between both the individual particles and the substrate. 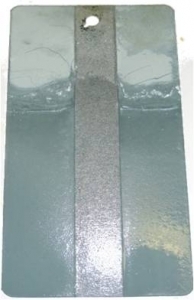 This greater density of active zinc per given area combined with the good conductivity of the layer ensures that charge flows through every millimeter that has been coated and therefore provides excellent cathodic protection. Passive protection, as provided by paints and cladding, creates a “barrier” between the steel substrate and the elements. Once this barrier is compromised, the moisture and atmospheric salts will be able to start corroding the steel beneath the damaged area. 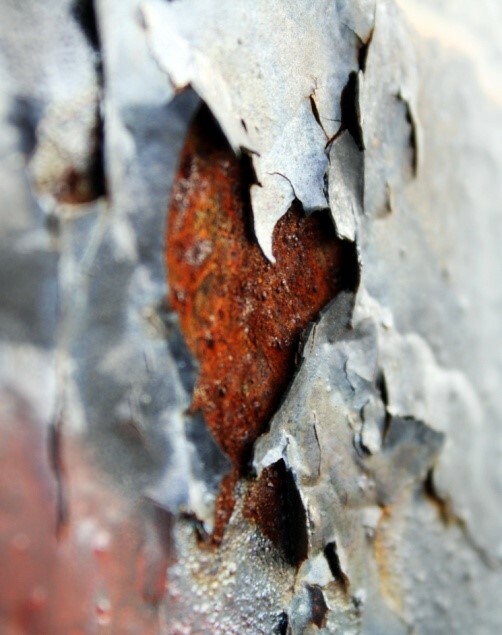 This corrosion will then begin to creep extensively beneath the coating. With ZINGA, the organic binder and the zinc oxide layer that forms on the surface create an impervious barrier by blocking the zinc’s natural porosity with oxide particles. Unlike other passive coatings, once breached, the zinc oxide layer simply renews itself by re-oxidising. This layer of oxides is the reason behind the matt appearance of ZINGA as opposed to the shiny hot-dipped finish.